In the last one-and-a-half years, 11 underpasses have come up in Gurgaon to make commuting smoother. But with five deaths in last seven months, experts say more needs to be done to make the structures safer. The Indian Express reports. On May 6, a pilot working with Indigo Airlines was on her way to the airport in a Swift Dzire. At the wheel was Vinod Kumar, a driver from Rae Bareli and the father of a five-year-old boy. Kishore Kumar Vishwas, a security guard from Bijnor, was sitting next to him. After picking up the pilot from her home in Gurgaon’s Sector 61, the vehicle travelled along the upscale Golf Course Road, home to several MNCs, malls and gated condominiums. Kumar hoped to take advantage of the three underpasses along the stretch to reach the Delhi-Gurgaon expressway faster. Around 5 am, seconds after the vehicle entered the Sikanderpur underpass — the last of the three — tragedy stuck, and only one of the car’s occupants made it out alive. According to Gurgaon police, as soon as the cab entered the underpass, it collided with a Scorpio travelling in the wrong direction. A day later, the errant driver was arrested. Police said he was travelling from Sector 54 towards MG Road, but had missed the turn for his destination and entered the underpass by mistake. But instead of going through the underpass and taking the first U-turn, he turned his vehicle around inside the underpass itself, resulting in a collision that killed Kumar and Vishwas. The duo is not the only casualties as a result of accidents inside the many underpasses that have opened their lanes to commuters in Gurgaon over the last two years. 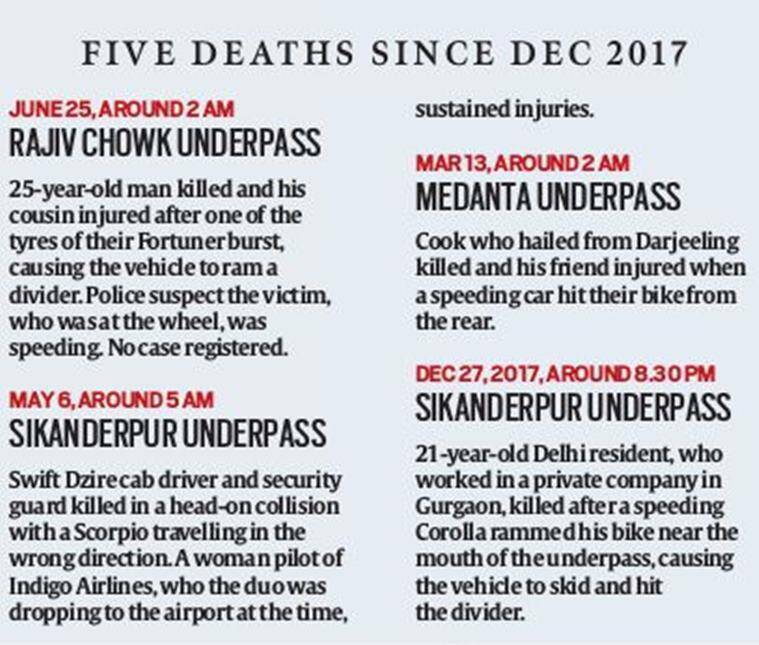 According to police records, four fatal accidents have taken place inside underpasses in Gurgaon since December 2017, with five casualties reported. The ever-growing city now has a total of 11 underpasses, which cover National Highway 8 as well as the stretch between Cyber City and Golf Course Road. A twelfth underpass at IFFCO Chowk — construction of which is currently halted because of a petrol pump that stands in its path — is likely to be opened to commuters in the coming months. The structures, though, have emerged as an Achilles heel for Gurgaon residents — while they have largely resolved the issue of traffic jams and congestion, experts say they have also increased the scope for accidents. While one fatal accident was a result of wrong side driving, two have been attributed to overspeeding. The fourth incident was due to poor lighting inside an underpass used by vehicles travelling from the direction of Medanta-The Medicity towards Delhi via the Delhi-Gurgaon expressway. In the incident, a man from Darjeeling, working as a cook in Manesar, was killed when a speeding vehicle hit his bike inside the underpass. His friend, who was with him, had alleged that the structure was dark at the time. Officials from the National Highways Authority of India (NHAI) have since conceded that the underpass, having been inaugurated before the deadline initially set for it, had not been provided with a direct electricity connection until July, as there was “not enough time to complete paperwork” for it before it was opened. As a result, until last month, electricity was being supplied using diesel generators. “A direct connection from Dakshin Haryana Bijli Vitran Nigam (DHBVN) has been obtained now, but this too is erratic because the supply is affected by usual outages that impact all of Gurgaon… We are not permitted to use diesel generators as backup, but can only activate them during emergencies such as flooding,” said an official on condition of anonymity. “The underpasses are due to be handed over to the Gurugram Metropolitan Development Authority (GMDA) soon and, to be honest, the only way they can rectify the situation is by installing solar panels, which will store electricity and allow a more stable supply,” he said. Residents, however, draw attention to another, more troubling, issue with the underpass — a sharp right that creates scope for drivers to lose control. Road safety experts attribute accidents inside these underpasses to a mix of many factors — from “traffic engineering defects” to a “vacuum of enforcement”. “One of the biggest issues has been in integration of underpasses with other roads. The fact that vehicles emerge from underpasses at a high speed and merge onto roads, where vehicles move relatively slower, has not been taken into consideration. As a result, vehicles suddenly brake, leading to rear-end collisions,” said Dr Sewa Ram, professor at the Department of Transport Planning, School of Planning and Architecture. The stretch between the Genpact junction on Golf Course Road and Cyber City bears testimony to this. Home to three underpasses that have been constructed in continuation, the area has become infamous for vehicles travelling at speeds of up to 120 kmph, despite boards alerting drivers to a 50 kmph limit. The first fatal accident in an underpass in Gurgaon was, in fact, reported from the one in Sikanderpur — which connects Golf Course Road to Cyber City — on December 27 last year. According to police, a 21-year-old Delhi resident was killed after his Hero Splendor bike was hit by a speeding Corolla near the mouth of the underpass. The incident took place around 8.30 pm, when he was heading home from a private company in Gurgaon. Officials from DLF, in-charge of maintaining the six underpasses that lie along Golf Course Road and Cyber City, blamed the speeding on a dearth of enforcement. NHAI officials, similarly, waived off responsibility for accidents that take place inside the five underpasses under their charge, blaming them instead on a lack of vigilance by traffic police. “The underpasses have already been constructed as per sanctioned scope. Additional signboards have also been provided, as per suggestion of traffic police,” said Ashok Sharma, NHAI project director. “We have installed 25 signboards across the underpasses to encourage people to follow certain guidelines, including maintaining a speed of 30 kmph. We intend to install another signboard inside the underpasses in the coming days, encouraging drivers to turn on their vehicles’ headlights as they enter,” said Saurabh Singhal, team leader and traffic transportation expert, Bloom Companies LLC, the consultant for underpasses at Signature Tower junction, Rajiv Chowk and near Medanta. Road safety experts, however, insist that simply placing signages is not enough. Instead, focus should be on putting them up at correct places, along with guidelines for “all categories of vehicles”. “Speed signages must be there after every intersection and for every category of vehicle. At the moment, these are missing for certain categories, such as two-wheelers,” said Rohit Baluja, director of the Institute of Road Traffic Enforcement (IRTE). Reiterating this, Dr Ram added that placement of signages alerting people about the route they need to take is equally important to avoid chaos and confusion, which often lead to last-minute turns and increase the scope for accidents. “Signages are often placed too close to the underpasses for people to make a decision in time about which route they need to take. As a result, people go the wrong way and then try to travel against the traffic to fix the mistake. Signages need to be a continuous process, placed at least 100-120 metres before the point at which people need to make a decision regarding their route,” he said. The biggest cause of accidents in underpasses, however, is believed to be a dearth of enforcement by traffic police, with experts and residents agreeing that vigilance on the ground could have prevented at least three fatal accidents. “There is no regulation or enforcement in Gurgaon, especially in terms of speed and lane management. So drivers become lax about things like turning on their headlights, which too can cause accidents,” said Baluja. A high-ranking police officer, however, said enforcement inside underpasses is a tricky task, since speeding vehicles pose a danger to personnel who may be deployed in the area to check the problem. “Placing our personnel inside underpasses where vehicles are travelling at 100 kmph and expecting them to stop vehicles is impractical. The structures are not long enough for drivers to have a warning that there are people on the road, and drivers may, intentionally or unintentionally, injure our officers,” said the officer. However, Gurgaon police and the GMDA are working on a plan that may resolve this problem: installing CCTV cameras across Gurgaon, which may serve as an alternative to feet on the ground inside the underpasses. “These high-quality CCTVs will ensure better surveillance across the city, including underpasses. They will track violations and challans will be sent automatically to homes of violators,” said Hitesh Yadav, ACP (Traffic). V Umashankar, CEO of GMDA, said “the detailed project report (DPR) for the installation of CCTV cameras is ready, and the proposal is likely to be presented before the executive body of the authority this month”. ACP Yadav, however, added that until the cameras are installed, Gurgaon police is working towards other measures that can be taken to curb accidents and violations. For residents, the concerns aren’t limited to vehicles, but to pedestrians and cyclists as well. Even as there has been a proliferation of underpasses and flyovers in Gurgaon over the last two years to ease traffic, subways and foot overbridges haven’t come up at a similar pace. While NHAI has installed such structures at Rajiv Chowk, IFFCO Chowk and Signature Tower junction as part of their traffic improvement project, those using Golf Course Road on a daily basis continue to put their lives at risk as they pass through the stretch amid speeding vehicles that emerge from underpasses without warning. According to Gurgaon police data, there were 144 recorded pedestrian deaths in the city in 2017. “Underpasses in Gurgaon are definitely a huge help for people commuting by cars, but a big pain for others, especially pedestrians. There are no foot overbridges for them to cross the roads. It’s like Golf Course Road has been built only for people living and working in the DLF area,” said Vaibhav Srivastava, a resident of Uniworld Gardens, Sector 47. But Umashankar from GMDA, which has recently taken over Golf Course Road, said the authority is working on a solution. “We were trying to make pedestrian and cyclist tracks along the stretch, and had even proposed an estimate on the basis of which a ground survey was conducted. But we eventually found that there was no right of way for the project, because of which it seems difficult to execute. We are now looking at other ways to approach the matter,” he said.